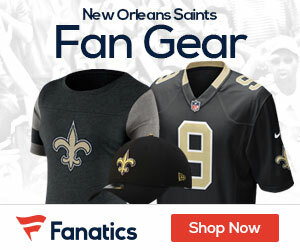 Beginning this coming Tuesday morning, fans of the New Orleans Saints will be able to attend the very first practice of the team's 2017 Mini-Camp; which begins at 11 a.m. Central time and lasts until to 1:20 p.m. at the team's Practice Facility on Airline Drive in Metairie (suburban New Orleans). As it is every year, this year's Mini-Camp is 3 days long (Tuesday through Thursday); although this year fans will be able to attend ALL 3 days worth of practices, as the team has made each daily session open to the general public. The gates to each practice will open at 10:15 a.m., and admission to practices is free; with parking available right next door at the Shrine on Airline (formerly known as Zephyr Field), which is now home to the Triple-A baseball New Orleans Baby Cakes. After finding a parking spot, fans can walk over to the adjacent Saints Training Facility at 5500 Airline Drive and view the practice sessions. Keep in mind: seating is limited, and some fans may have to find SRO (standing room only). If for some reason that bad weather forces the Saints to practice inside of their indoor facility, then the session will be closed to the general public (due to a lack of space inside of the enclosed building). The 3-day Mini-Camp is the last time that the team will practice together for over a whole month, as the entire organization begins a month long vacation right after the conclusion of Thursday's final practice --- before players report to Training Camp later next month during the final week of July. Tuesday's practice will be the first real opportunity for fans to view this year's team, as the organization continues its preparations for the upcoming 2017 NFL season --- a season viewed by many at the moment as one of the most critically important in recent team history. With that in mind, we're presenting readers who have planned to come down to NOLA and attend this coming week's practices in person; with a quick list of 5 Saints players to watch at 2017 Mini-Camp, whom we feel deserve a "closer look" from Saints fans throughout the 3 days. Nowadays in the both the NFL and big-time college football, we often hear the term "ball hawk" used to describe a player on the defensive side of the football --- usually a defensive back --- that has developed a stellar reputation for always having a knack for being around the football on a given play, and then coming up with a big play (i.e. a pass "break up", a big hit, a forced fumble, or an interception) afterwards. For the Saints, they've been fortunate to get a young man in the Draft a few months ago who is the classic textbook definition of that term. In fact, they need to put a picture of him right next to the term in the Football 101 dictionary: rookie free safety (out of the University of Utah) Marcus Williams. Just last week Williams drew the praise of both the coaching staff and veteran teammates alike, for his standout performance at OTA's recently. On one play he "blanketed" the sideline before knocking away a pass intended for WR Brandon Coleman; and then a few plays later denied 4th year veteran WR Corey Fuller on what's known as a curl route, by quickly diagnosing the play and then darting in once again to break up the pass thrown by QB Drew Brees. Considering that the Saints were able to not only get a player of Williams' caliber in the 2nd Round, the fact that they were also able to get an immediate starter as a rookie at the very same position where they recently had to release the previous veteran starter for poor performance (Jairus Byrd), is a major stroke of good luck. Keep an eye on #43 this week, and see if you don't come away just as impressed as the Saints themselves have about him so far. The Saints organization and in particular the veteran Saints players themselves; have shamelessly been gushing over the recent addition of Peterson, as if they were a group of love-struck teenage girls at a One Direction concert. That's because even though he's now 32 years old, Peterson appears to be in top physical condition (and might even be in the best physical shape of his life) after he missed most of the past season last year with the Minnesota Vikings, due to a knee injury. If --- and it should be stressed: "if" --- Peterson is even anywhere close to being the player he was a few years ago (in 2012) when he ran roughshod over the rest of the NFL on his way to over 2,000 rushing yards, then the entire League could potentially be in huge trouble as they try to figure out who to stop first in an offensive backfield that will feature two future 1st-ballot Hall of Famers (Peterson and Brees) in the line-up at the very same time. Additionally, based on the handful of interviews with the media that Peterson has had recently, it would appear that the 4-time former All-Pro RB is HIGHLY motivated to prove to everyone that his career has been "written off" prematurely, and that he can still play at a very high level in spite of those who say he might be 'past his prime'. The thing to remember for Saints fans as they watch #28 in action this coming week: this is only just Mini-Camp, and not Training Camp or the Pre-Season yet when Peterson will finally be taking live hits once the team is practicing or playing in full pads. As it is, the Saints will probably limit Peterson's contact until the season opener at Minnesota against his former team on September 11th; and word is that Peterson night not see much action at Mini-Camp other than a "cameo appearance" for the sake of the fans. But nevertheless, seeing players of the caliber together that Brees and Peterson are; is an opportunity that no football fan and definitely not any Saints fan, should ever miss. Let's be totally honest: before the news broke that star veteran defensive tackle Nick Fairley might miss the 2017 season and beyond due to a heart condition, no one was really expecting too much from 2nd year player and 2016 4th Round draft pick David Onyemata. But now with the distinct possibility that Fairley could miss time as he awaits a 3rd opinion of his medical status, Onyemata has suddenly been thrust into the limelight. The loss of Fairley on the Saints defensive line rotation would likely put 2nd-year player and last year's top Draft pick Sheldon Rankins at the top of the depth chart, where he would play next to nose tackle Tyeler Davison in the base 4-3 defense. But it also means that Onyemata will likely be the one player who as of right now, who would likely take on a bigger role in the substitution packages for the Saints pass rush, in Fairley's place. Last season in limited action as a rookie, the 6-foot-4, 300 pound Onyemata finished the season with 18 combined tackles but showed a lot of potential, enough so that the Saints began using him immediately -- placing him into the lineup due to a leg injury suffered by Rankins. However, he was used somewhat sparingly after Rankins' return; although he ended up playing in 36% of the team's defensive snaps in 2016. If there's any "upside" with Onyemata being the one who might bear the responsibility of filling Fairley's role on the Saints D-Line, it's that he should have much a stronger understanding of the Saints defensive system heading into his 2nd year. As Saints fans pay extra close attention to #93 this week, let's see if the former Canadian college football defensive Player of the Year appears ready to take the "next step" after being thrown into the line of fire. We've highlighted rookie UDFA wide receiver Travin Dural in several previous articles for the simple fact that he not only is a Louisiana native (from the town of Breaux Bridge, La.) and a graduate of Breaux Bridge High School; but also because he is immensely popular among a large segment of Saints fans since he played up the road in Baton Rouge at local college powerhouse LSU. However, as we cautioned then and continue to caution now: those same fans -- no doubt many of them who will be in attendance during these practices -- should probably temper their expectations somewhat; given that Dural will have to fight his way through a handful of other players at the WR position just to even have a legitimate shot at making the final 53-man roster. Besides starters #1 WR Michael Thomas, #2 WR Willie Snead, #3 WR Ted Ginn, Jr., and #4 WR Brandon Coleman, Dural is also presumably behind Tommylee Lewis (last year's #5 WR), Corey Fuller, Jake Lampman, and Jordan Williams-Lambert; and will have to surpass all of them before he can even worry about becoming the 5th (and possibly the final) wide receiver on the Saints roster. At this point, those Saints fans who consider themselves die-hard LSU fans should be content with #14 having a good enough performance in front of the home folks, to persuade the Saints coaching staff to consider giving him a spot down the line on the team's Practice Squad. Because if we're going to be brutally honest: Travin Dural has a long way to go, if he intends to ever have an NFL career like former LSU teammates Odell Beckham, Jr. and Jarvis Landry have had so far. The final player of the 5 Saints who we've chosen to highlight for this article, we saved Kikaha for last for the simple fact that he might just be THE one player who could potentially impact the upcoming season for the team on the defensive side of the football unlike any other --- IF it's proven that he can come back from an unbelievable 3rd injury that he suffered last year to the very same knee that he's torn 2 other times previously in college. Kikaha will be facing some long odds, since he will have to overcome the mental and physical aspects of the injury; as well as the fact that there's only been one well-documented successful return of a player injuring the same knee 3 DIFFERENT TIMES (Carolina Panthers All-Pro LB Thomas Davis) and still being able to recover well enough to go on to have an outstanding NFL career. Up to this point however it would appear at the very worst, that Kikaha is going to be given every opportunity by the team's coaching staff to win his old job back. Kikaha was present throughout the entirety of OTA's the past few weeks, and even took part in some team drills. It will be interesting to watch during these practices at Mini-Camp, as to just how ready #44 appears to be in reclaiming his starting role as the team's edge pass rusher opposite of Cam Jordan. The honest truth is that just as it is with veteran RB Adrian Peterson as well, it won’t be until when the Saints begin practicing in full pads and taking hits (or delivering them in Kikaha's case) during Training Camp and then playing the Pre-Season games beginning in August, that we will really and truly know just where Kikaha actually stands. Would Drew Brees Consider a “Manning Move” in 2018?